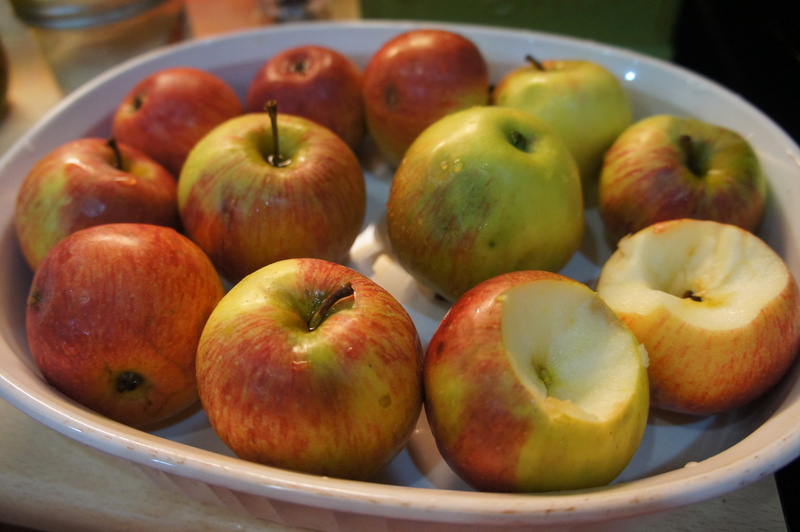 Baking apples in the oven, with nothing more than just good apples from the orchard of my grandfather. Cooked slowly in the wood oven of my grandparents, to give enough time to the juice to be released during the cooking process and to form a light but flavorful caramel on the bottom of the dish. And when I was a child, this was the best part of this dish! 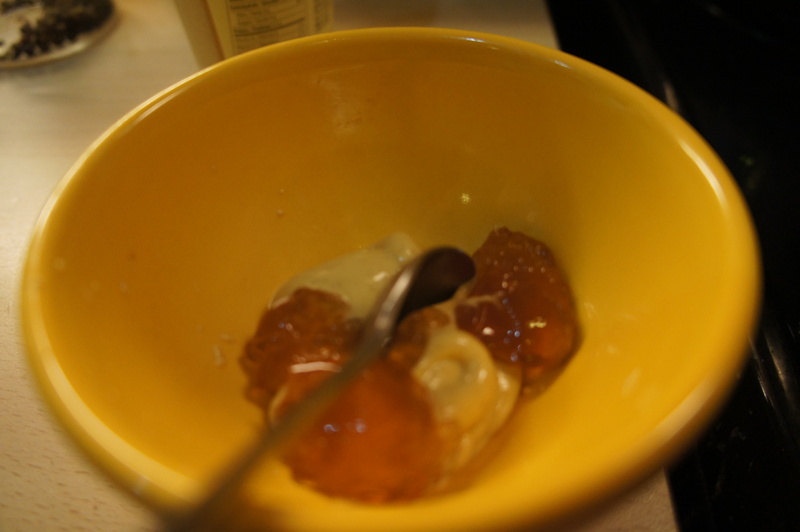 With a teaspoon, I have enjoyed (and still enjoy) removing every pieces of this fruity caramel. 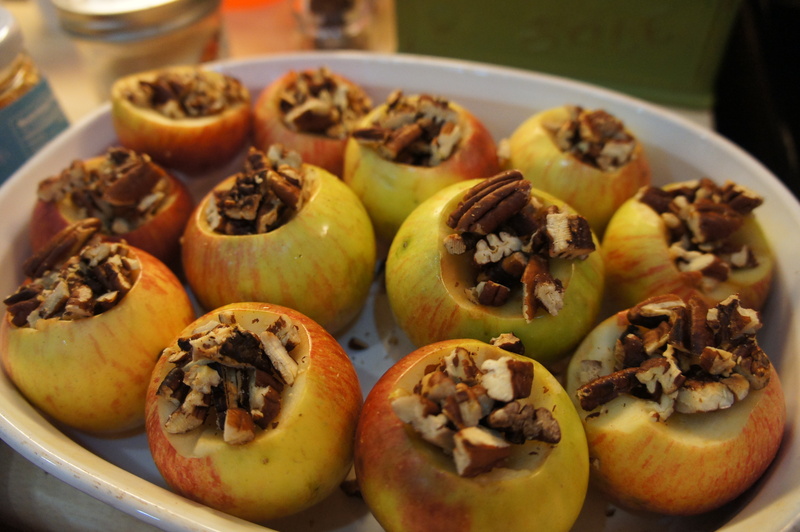 This is my new version of a French treat … with a little twist: beer or apple cider jelly with roasted pecans in the middle. Cucumbers are this kind of vegetable that I find boring. Mostly because I have learnt (when I was living in France) to make one major recipe with them, cucumber salad… cucumber salad… mixed salad with cucumber for a change. To say the truth, I also enjoy cucumber in sandwich: French baguette, brie, cucumber and sunflower sprouts. Yummy but this is only a few slices of cucumber… not really enough. As I try to diversify my diet, each time I go to the market or the small “fruits and vegetables” shop near my apartment, I can’t resist the temptation. And each time, 2 to 3 cucumbers are irremediably dropping into my shopping basket. This happens not only because they are cheap but also because I love their freshness. And to be honest, I am also aware that cucumber is good for your health! I know, I know we are focusing on the rainbow colors for fruits and vegetables, a real obsession because we have learnt that more colourful are the veggies and fruits, better this is for your health. But one of the general rules in nutrition and health sciences that I have learnt in my previous life (when I was a nutrition scientist) is the fact that nothing is everlasting. And as a result, I was not surprise when we have rediscovered a few years ago that white vegetables are also good for our health. White is now part of the “rainbow colours” good for your health, and cucumber is one of the good white veggies. Despite the fact that cucumbers are made up of mostly (95 %) water, they are rich in vitamin K (21 % of daily intake per 100 grams), B vitamins (~10%), copper (2%), potassium (4%), vitamin C (5%), and manganese (4%). In addition, they contain unique polyphenols and other compounds that may help reduce your risk of chronic diseases and much, much more. Cucumber can flush out toxins. All that water in cucumber acts as a virtual broom, sweeping waste products out of your system. With regular use, cucumber is known to dissolve kidney stones. Cucumber can protect your brain because of its anti-inflammatory flavonol called fisetin content that appears to play an important role in brain health by improving your memory and protecting your nerve cells from age-related decline. It will reduce your risk of cancer because it contains polyphenols called lignans that may help to lower your risk of breast, uterine, ovarian, and prostate cancers. 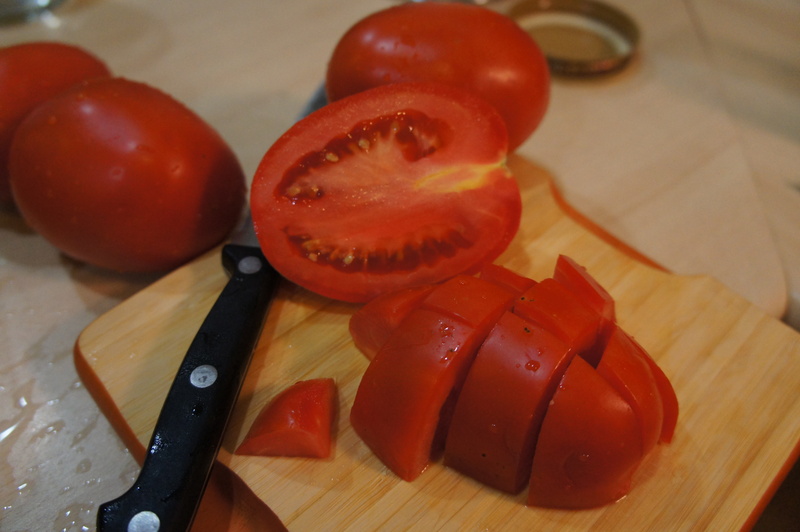 It also contains phytonutrients called cucurbitacins, which also have anti-cancer properties. It fights Inflammation by “cooling” the inflammatory response in your body, in part by inhibiting the activity of pro-inflammatory enzymes. Cucumbers have antioxidant properties because they contain numerous antioxidants like vitamin C and beta-carotene as well as flavonoids that provide additional benefits like “natural antihistamine ” & anticancer properties and that can also lower your risk of chronic diseases including heart disease. It can help to manage stress because it contains multiple B vitamins, including vitamin B1, vitamin B5, and vitamin B7 (biotin). B vitamins are known to help ease feelings of anxiety and buffer some of the damaging effects of stress. Cucumber can support your digestive health because it is rich in two of the most basic elements needed for healthy digestion: water and fiber.Cucumber skins contain insoluble fiber, which helps add bulk to your stool. This helps food to move through your digestive tract more quickly for healthy elimination. 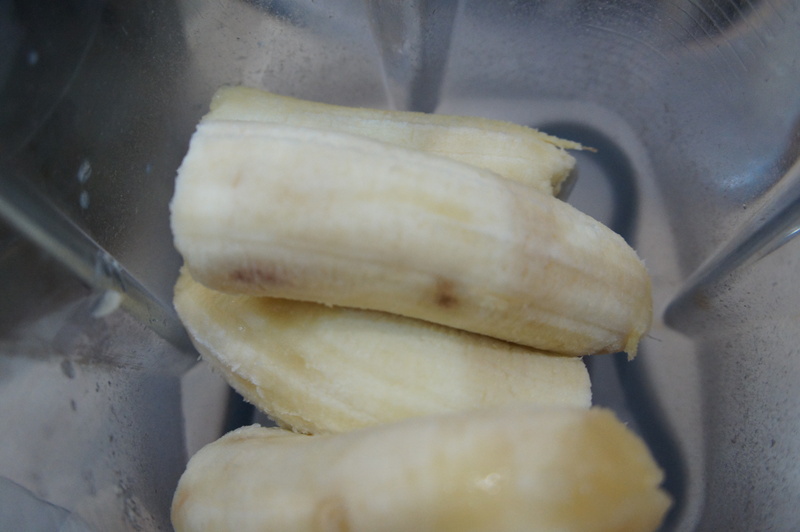 It can support heart health because of its contain in potassium, which is associated with lower blood pressure levels. Cucumbers can help with diabetes and cholesterol. It contains a hormone which is needed by the cells of the pancreas for producing insulin which has been found to be beneficial to diabetic patients. 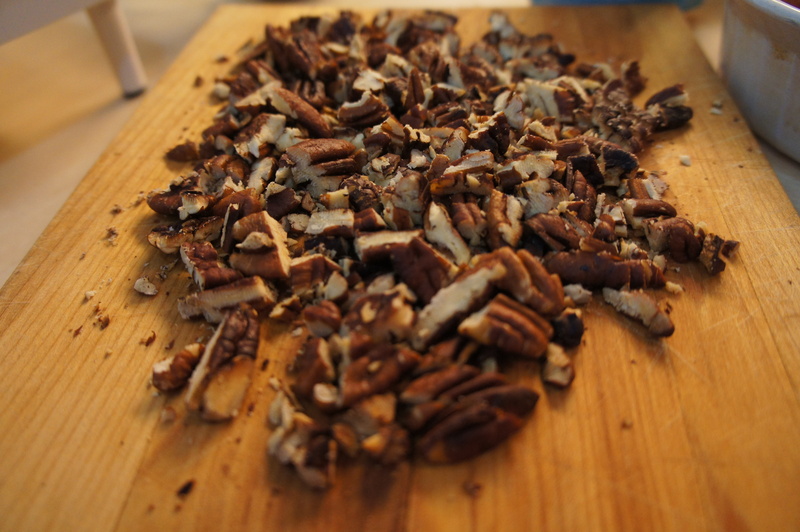 It also contains sterols that may help reduce bad cholesterol levels. It can promote joint health, relieves gout and arthritis pain. Cucumber is an excellent source of silica, which is known to help promotes joint health by strengthening the connective tissues. Who have thought that this watery fruit (yes, this is a fruit) is a super food! One thing I have learnt over the past two years is the fact that cucumbers make a great base for vegetable juice as well as smoothie because of its mild flavor and high water content. And this is how I really enjoy my 3 cucumbers in a weekly basis. 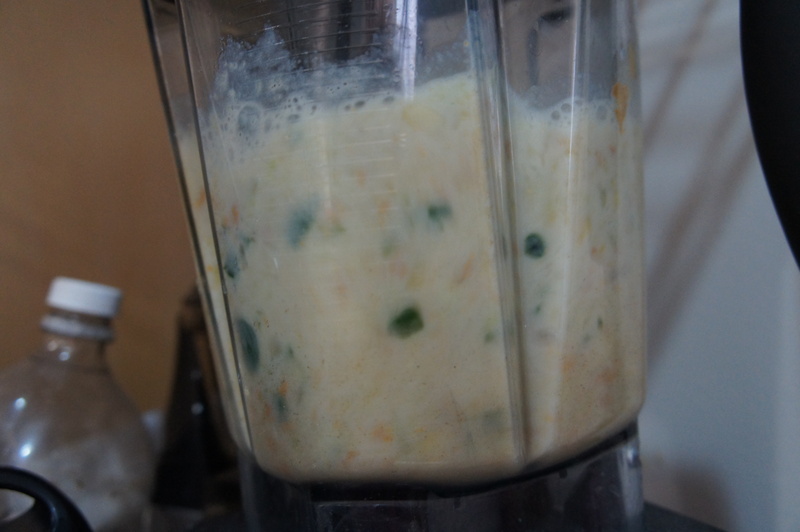 Put all ingredients into a blender in the order listed and blend until smooth. 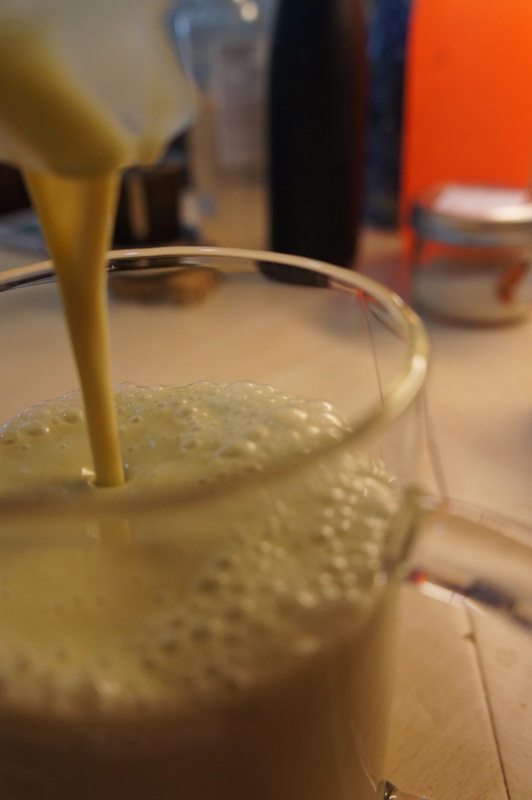 Blending times may vary depending on the type of blender you own. 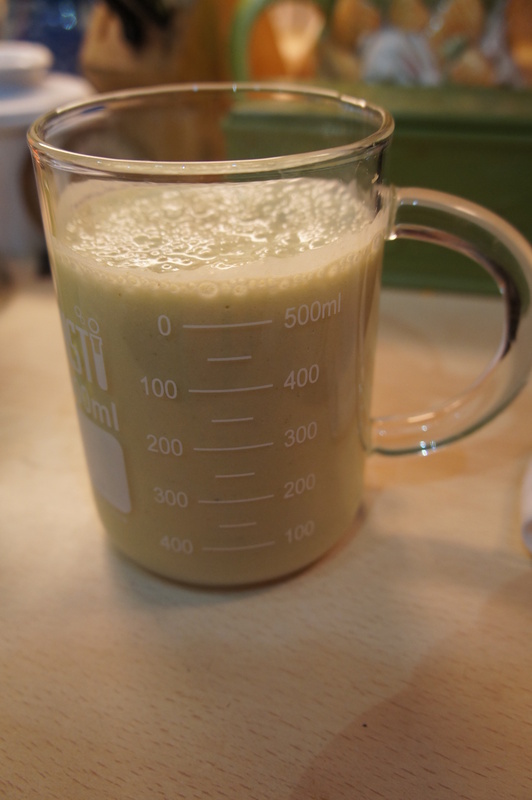 If you have a Vitamix blender, start the blender off on variable 1 and quickly increase to variable 10, then to high. 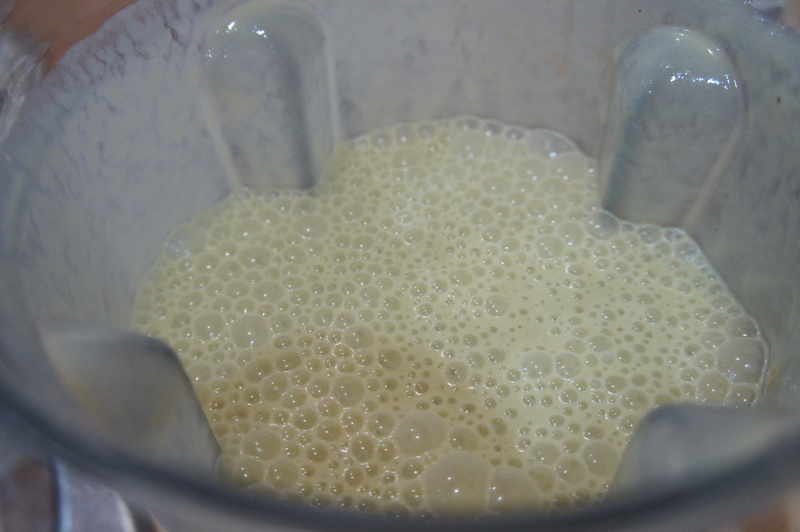 Let blend for about 20-30 seconds on high. 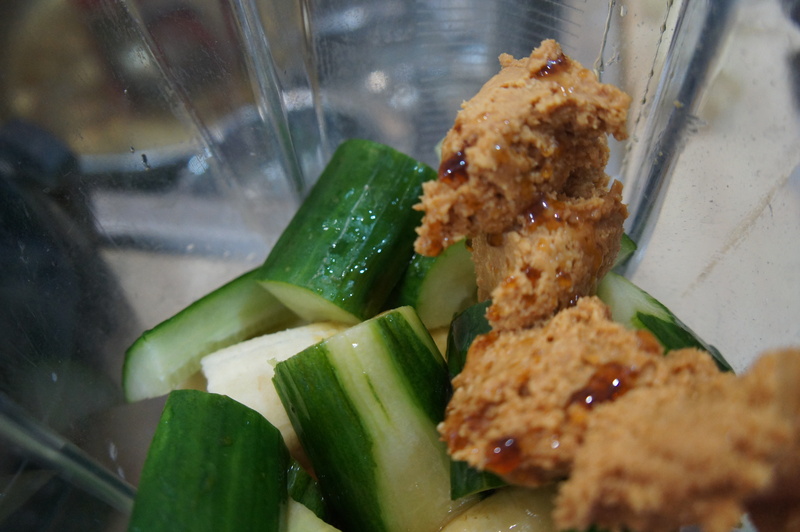 I love the combination banana, peanut butter and maple syrup, which is softened by the freshness of the cucumber. 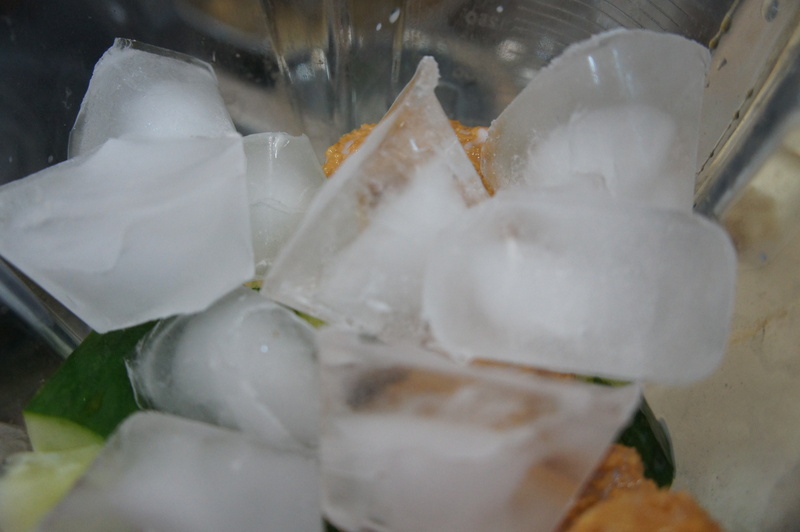 It is really refreshing! I drink some for breakfast and I keep one glass for later in the day as a snack – easy to carry in a thermos, easy to drink when you are in the go. I keep the leftover (if any) in the fridge for 24 hours maximum. 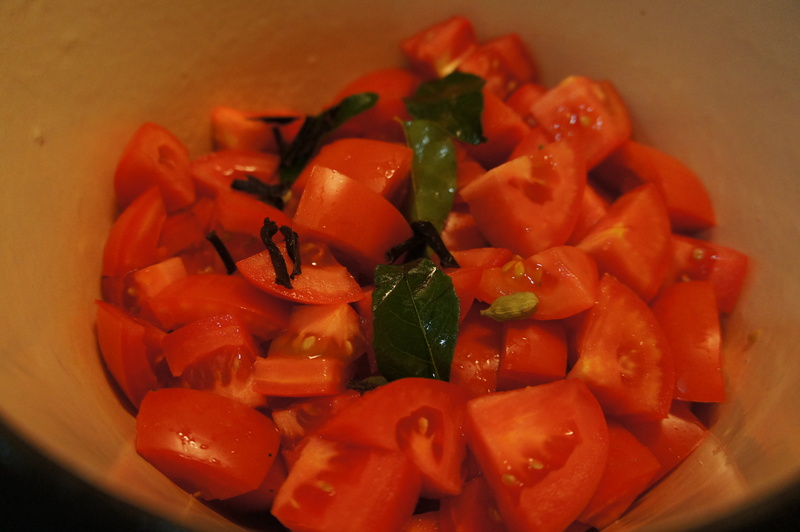 If you ask me what I want for lunch or dinner, most of the time, I would say a lot of yummy vegetables. Vegetable is my motto! 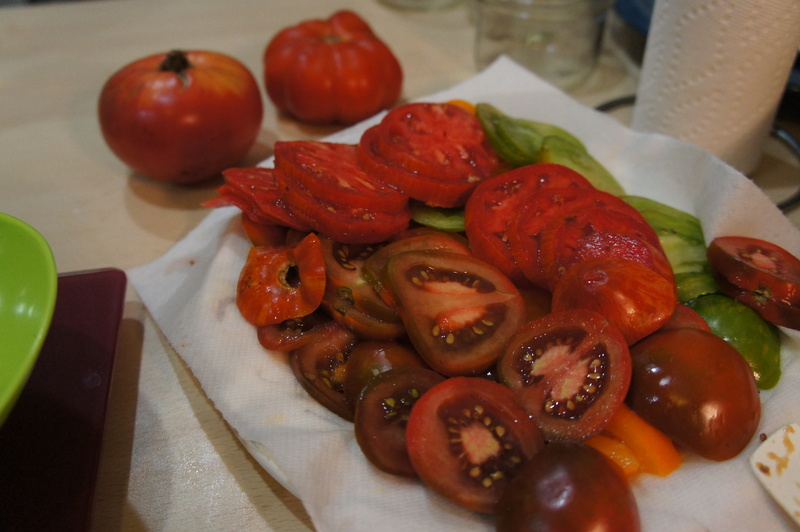 In fact, I have learnt to cook veggies here in Toronto with two of my best friends, Wendy and Peihong, both from China. In France, we cook a lot, and we love veggies, but most of the time we boil them before to sauté them in olive oil or butter: mushroom, spinach, green beans, peas… This is the way I was trained. Here in Toronto, I have discovered the technique of stir fry, and I cannot go back to the “boil everything” technique I have learnt in France. When I don’t make salads or vegetable soup, stir fry is my number one technique when I cook veggies. Rapid, tasty… We are enjoying our vegetarian meal… me for sure! 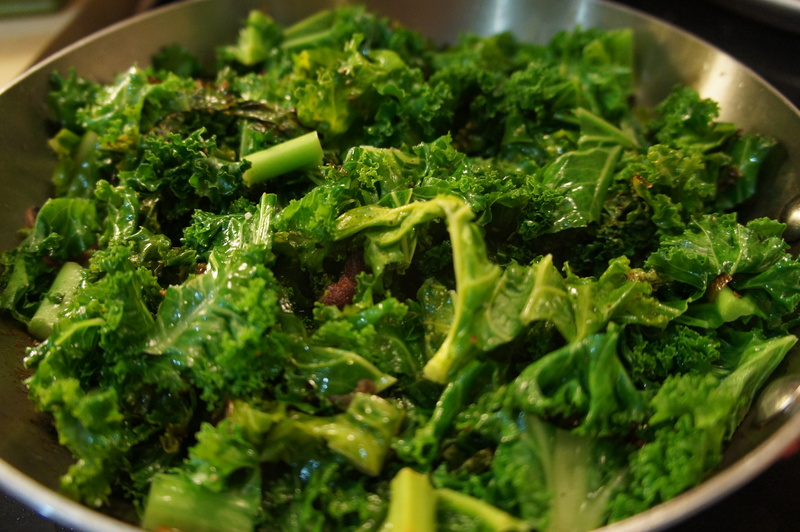 I have already talked about the nutritional and healthy benefits of kale in a previous blog. Kale is one of the healthiest vegetables on the planet. It is extremely high in vitamins A, C and K, all antioxidants known to help protect against cancer and heart disease. 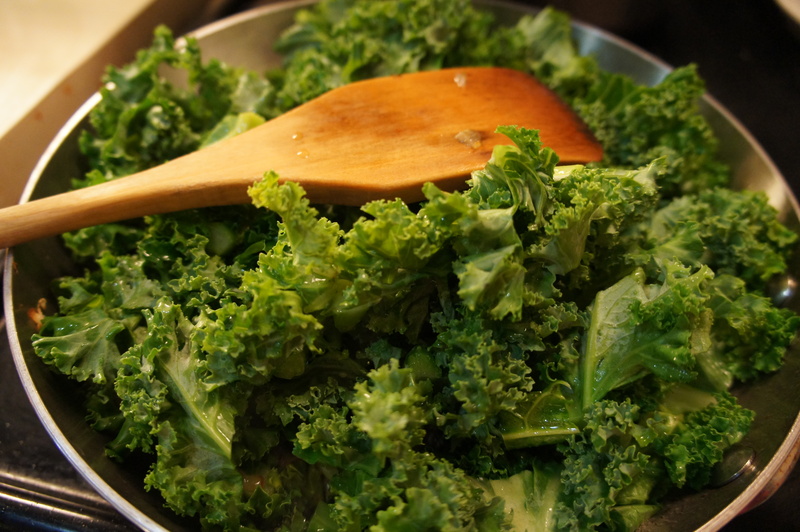 Kale is also very high in lutein which promotes healthy eyes. And for sure, kale needs to be part of your weekly food intakes. 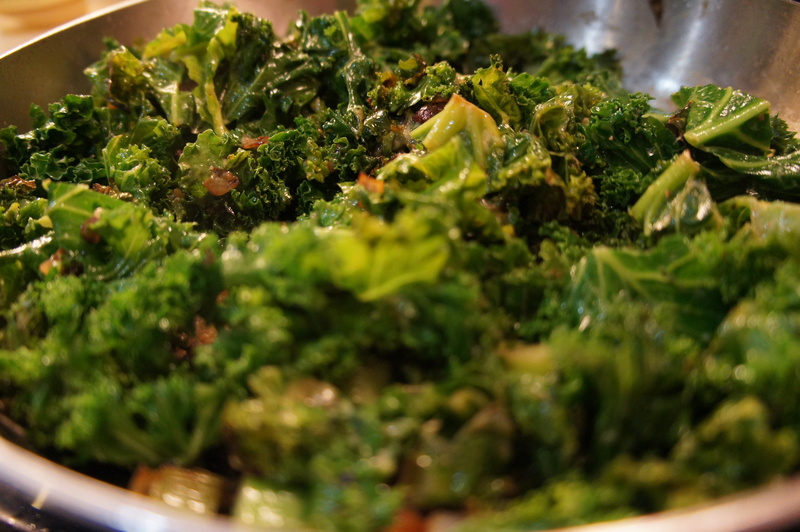 I try to eat kale two times a week and this is one of my favorite side dish. 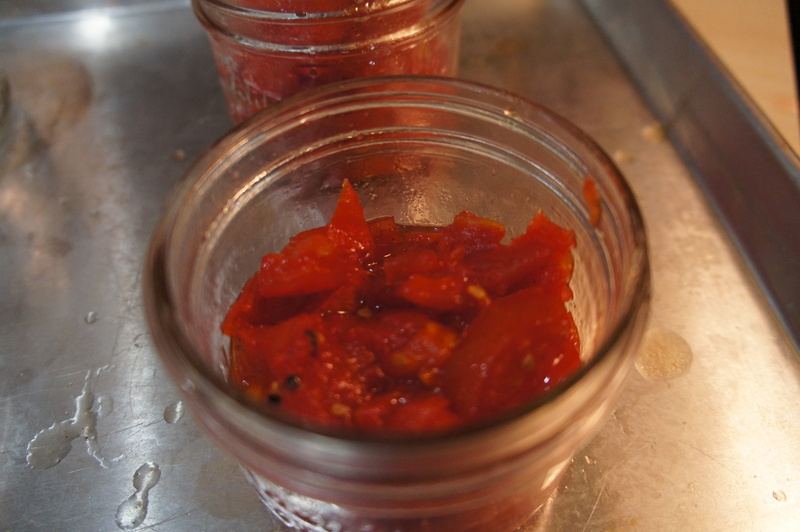 I love how a combination between three simple ingredients can bring so much flavors. Imperial IPA beer jelly/mustard balances marvellously the peppery taste of Kale. After my first try, I have made some research and I have found that hop flavors (as found in the Imperial IPA) pair amazingly well with green leafs like kale. This is a winner combination… a real alchemy. 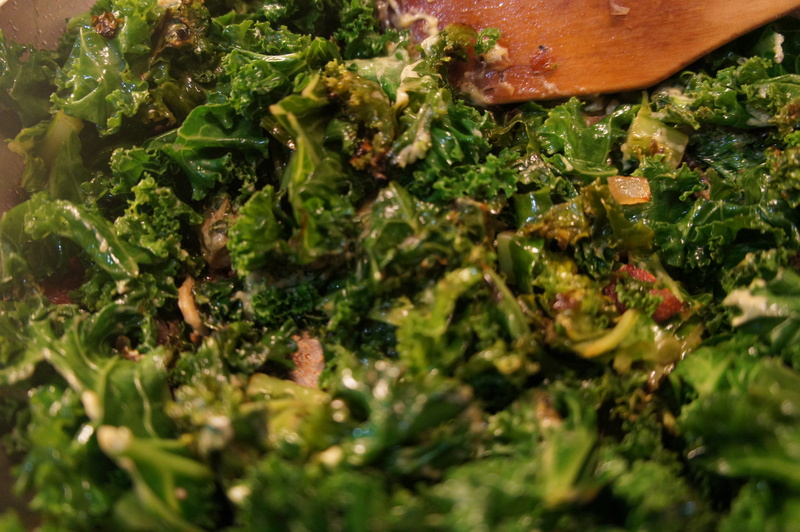 To say the truth, this is now how we cook kale at home. Each time, we say the same thing… again and again. This is so good, this combination works so well…. mummmm. 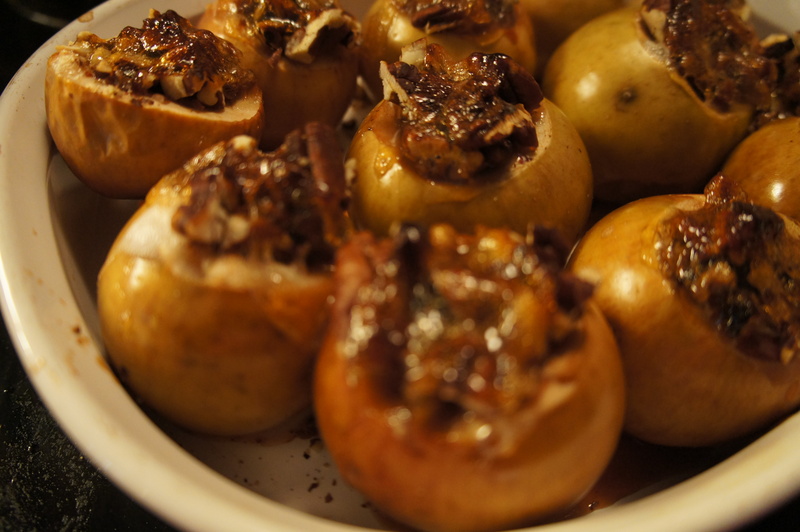 I hope you will try and enjoy this recipe with your family and friends. 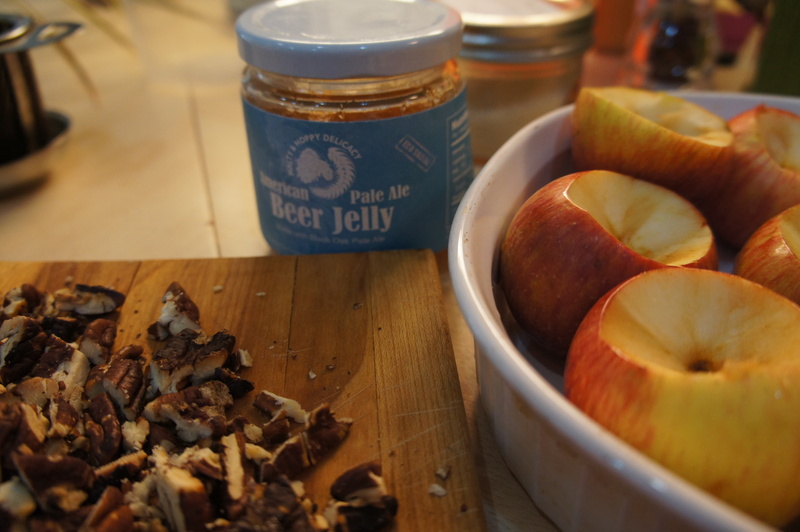 If you don’t have access to an IPA beer jelly, try an apple jelly or apple cider jelly. 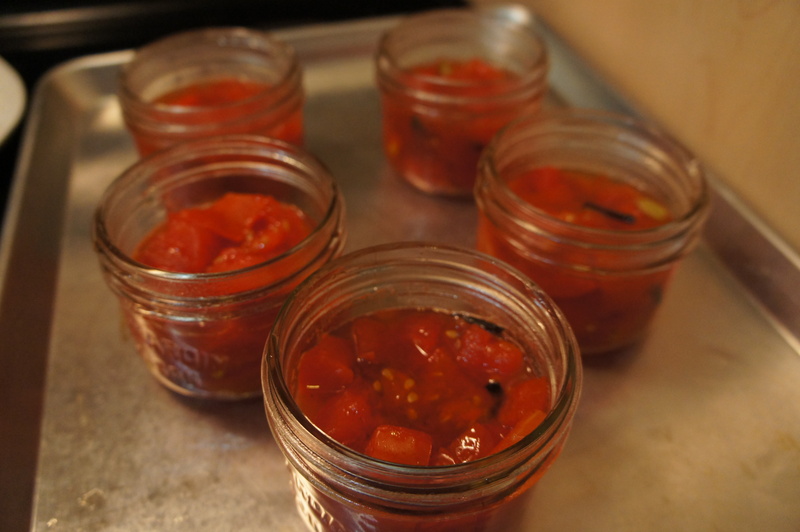 The key point is… the jelly need to be a little savory (not too sweet!). 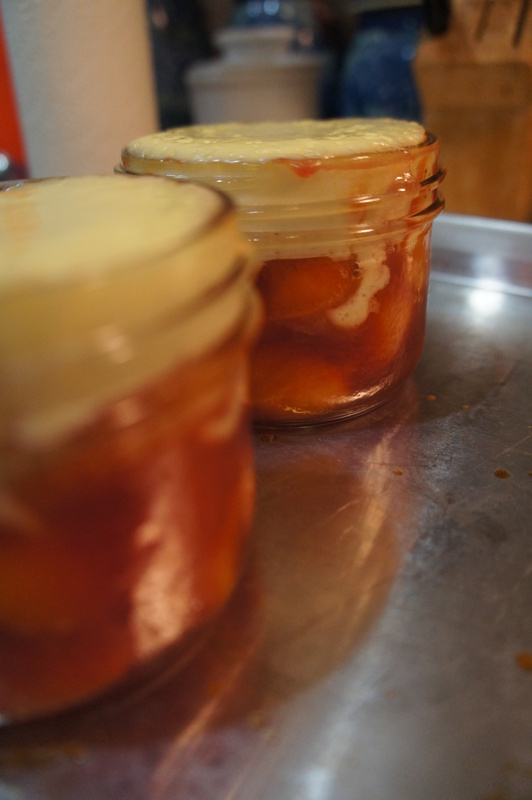 This summer I cooked a lot of peaches …. 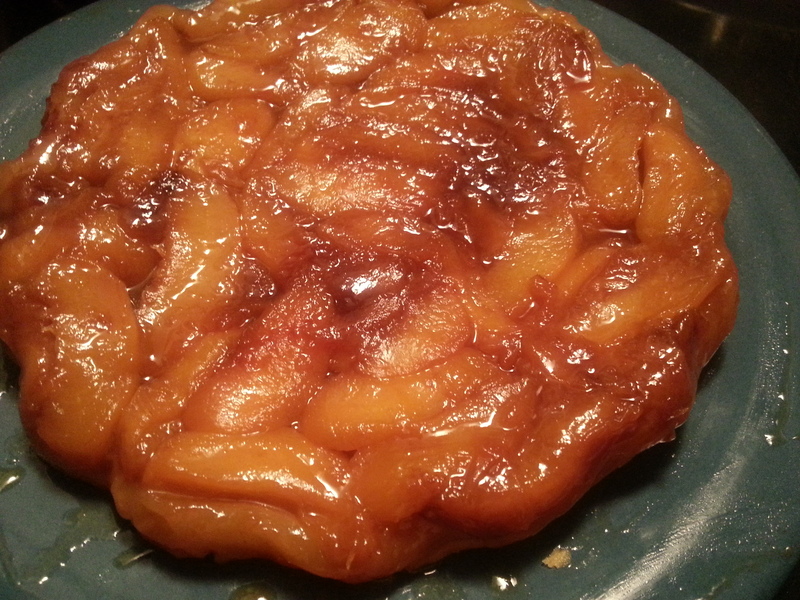 mostly because I wanted to nail one recipe, and one only: a French tatin peach pie. Peach pie can be really soggy, this was my challenge. It took me 6 to 7 peach pies, but now I nail it. 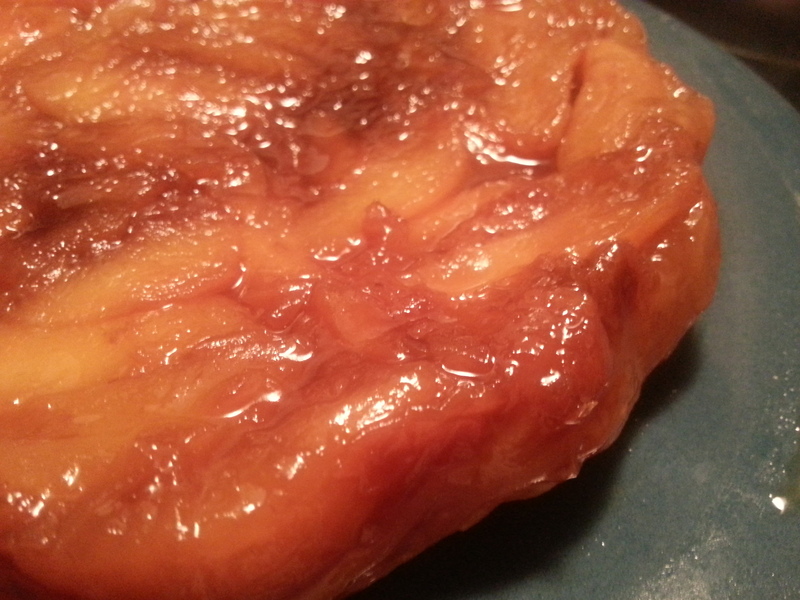 My peaches are perfectly caramelized and my tatin peach pie is not anymore soggy. The positive aspect of this experience is the fact that I have rediscovered that caramelized peaches in sugar and butter is real yummy. 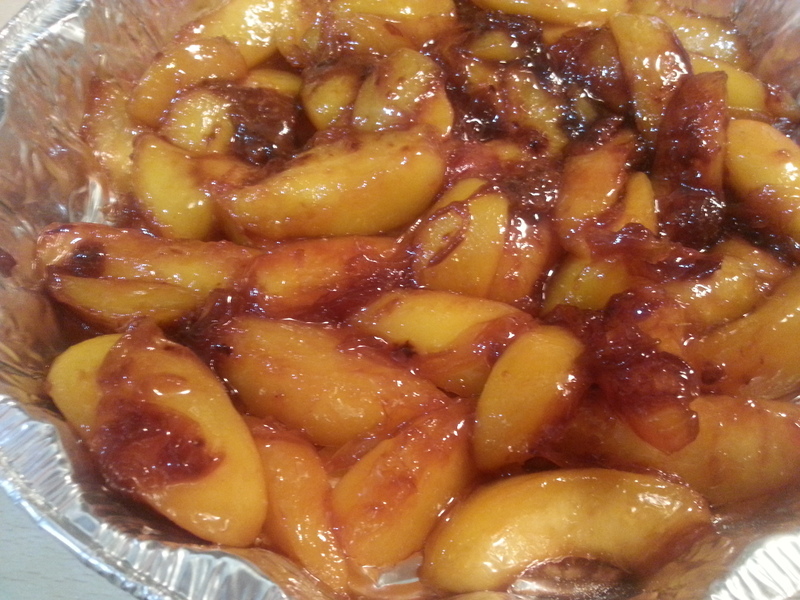 It also brought back some sweet memories: my grandmother sweet indulgence made with peaches. I wanted to bring back these memories, with a little twist. 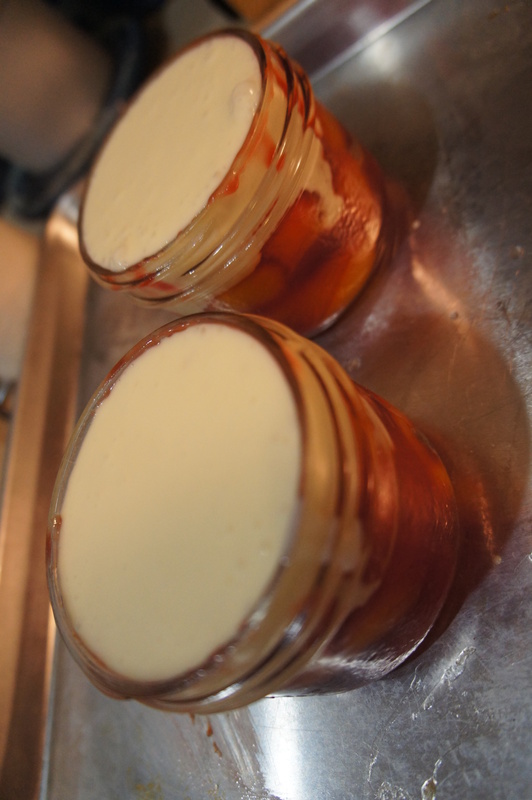 it gave me the idea to try baked yogurt pudding with caramelized peaches and American Pale Ale beer jelly. And it was not a mistake, it is gorgeous! 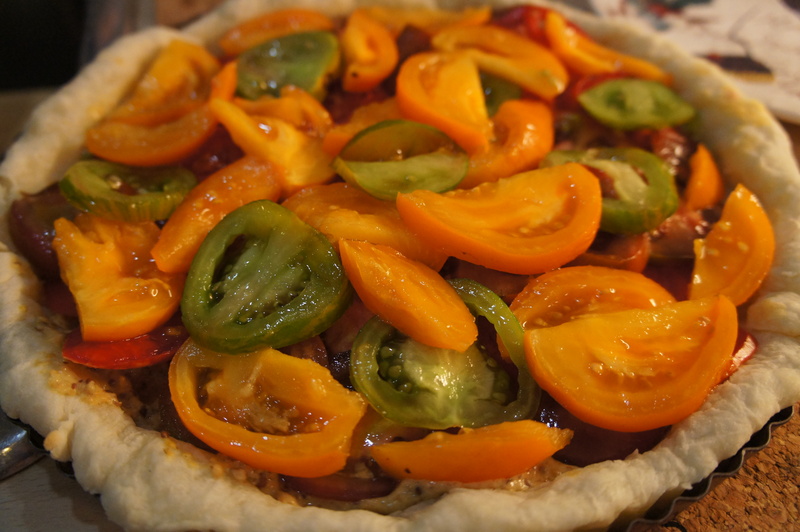 This is a classic in French cuisine – mustard, tomatoes and cheese layered on a flaky pie crust. 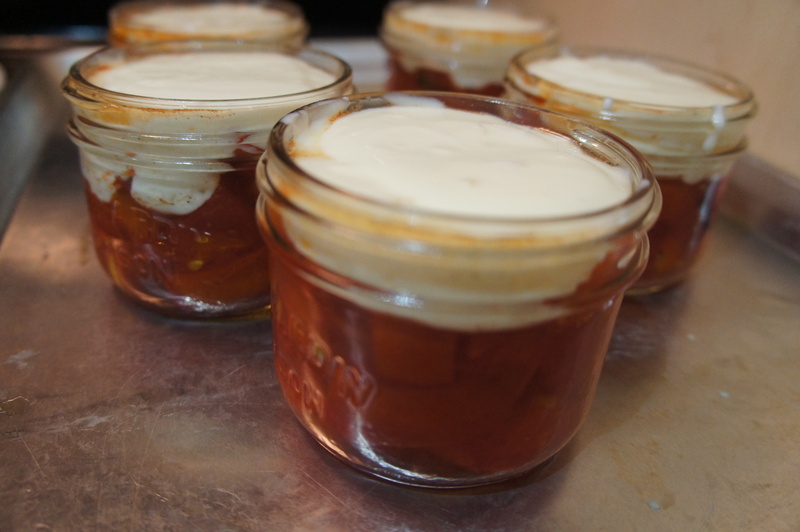 This was my first recipe published last year in my blog: Alchimie et gourmandise. We love this pie – we call it the French pizza. I wanted to revisit this classic this summer, and add a little of “je ne sais quoi…”. 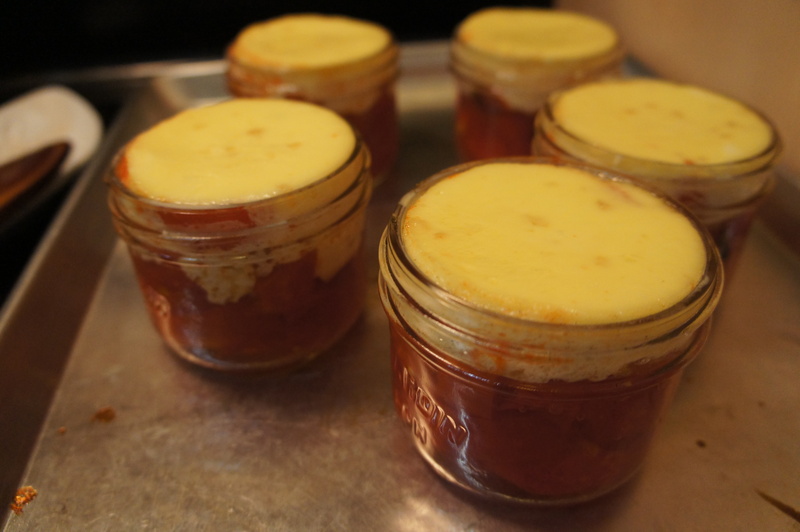 As I am working with local craft beer, my idea was to add some Imperial IPA beer jelly to the mustard and to pair this aromatic jelly with goat cheese… A must to try. 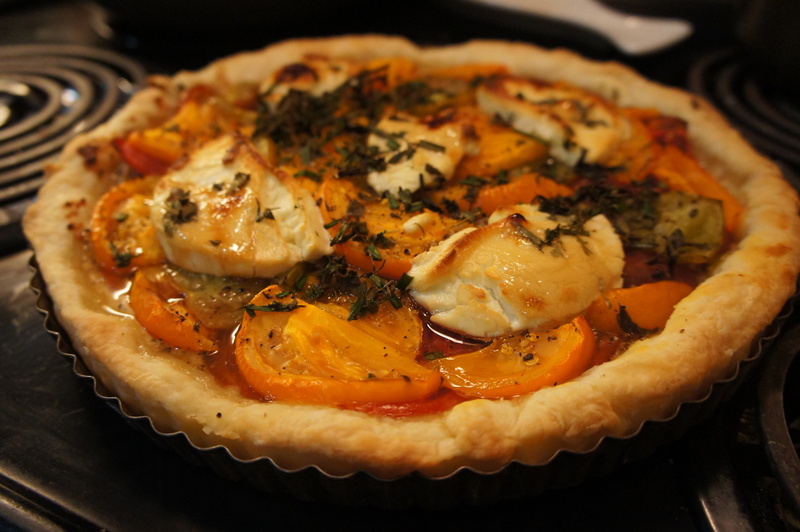 I hope you will enjoy this French pie with a Canadian twist as much as us. 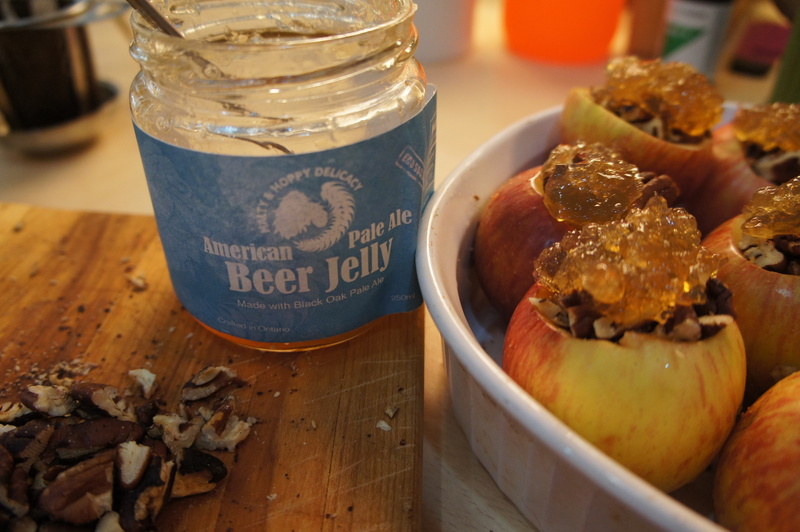 If you don’t have any beer jelly, don’t worry. 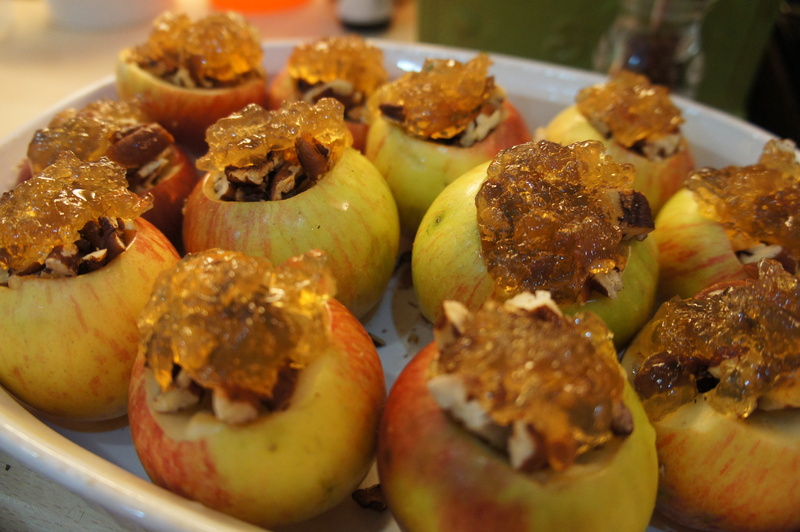 You can use also honey or apple cider jelly. 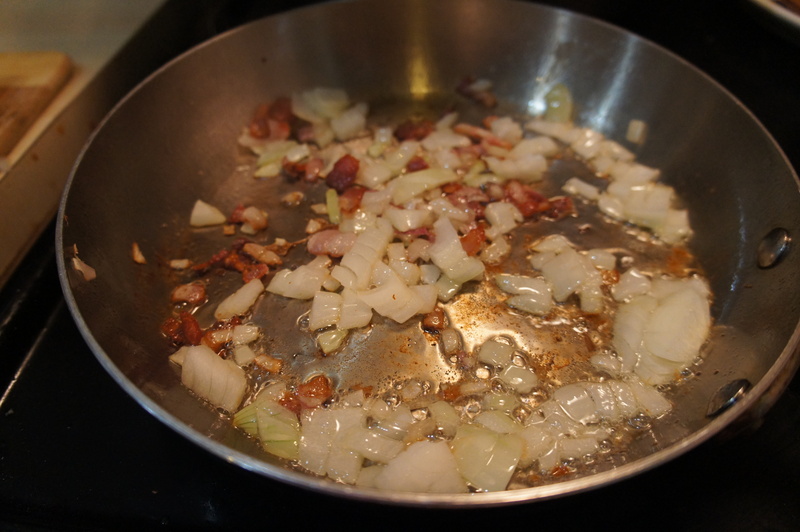 I use normally a combination (50/50) of artisan whole-grain mustard (not sweet at all) and Maille Dijon Originale mustard. French mustard like Maille is the best choice because it is not sweet and it will pair perfectly with the Imperial IPA beer jelly, honey or apple cider jelly. 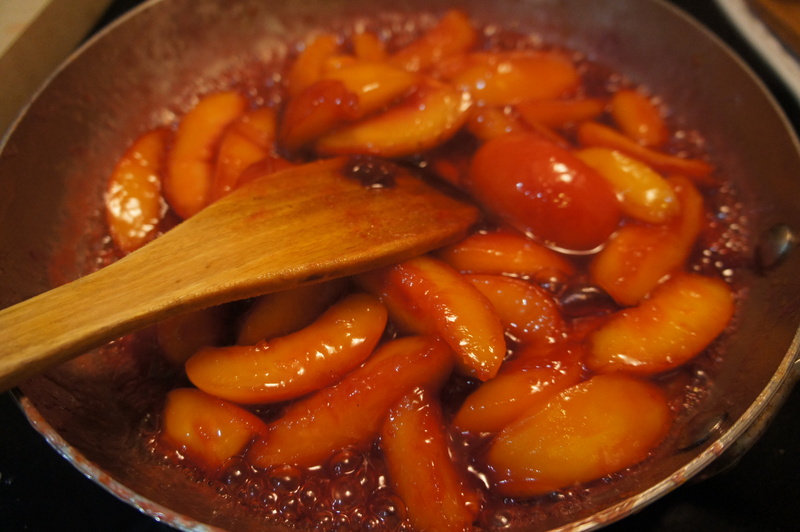 If you are using honey or sweet apple cider jelly, put a little less because it is going to be too sweet. (Peach is one of my favorite fruits during the summer season. 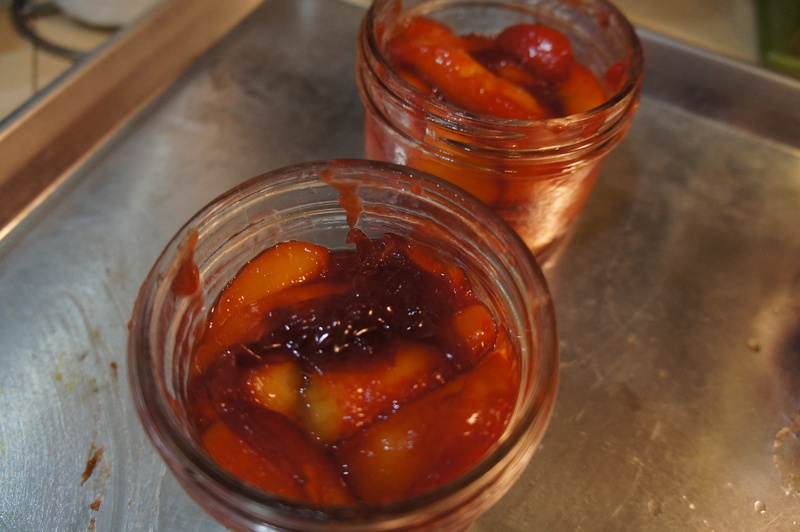 I think it might be strongly related to my great childhood memories: pick directly from the tree during a hot day or freshly bake – French peach pie or preserve for the winter season – jam and canning experience with my grandmother Adele. My grandparents had one kind of peach in their orchard – the “pêche de vigne” (peach of the grapevine), delicate small white peaches full of fragrances. It was (and still is) a delicacy! On the other hand, lemon verbena is a leafy herb with a strong lemony flavor. It originated in South America and was brought back to Europe, where it served as both a decorative and functional plant. 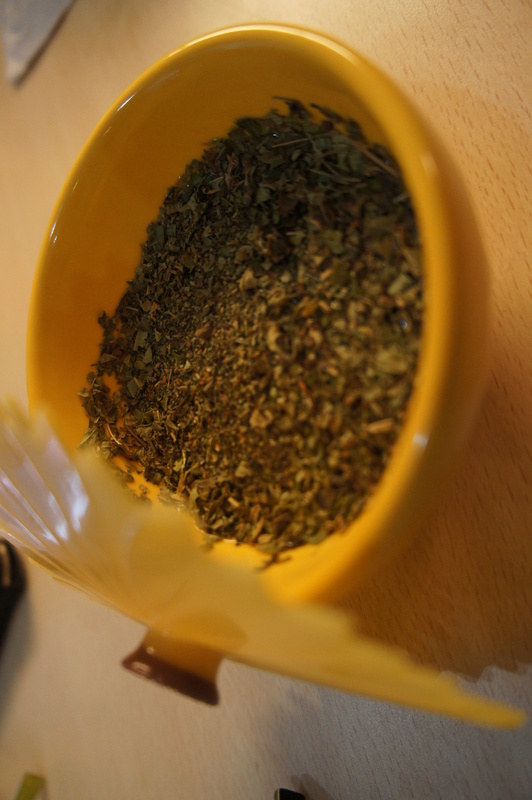 When I was living in France, verbena has been one of my favorite herbal teas, the most common use for a lot of people. 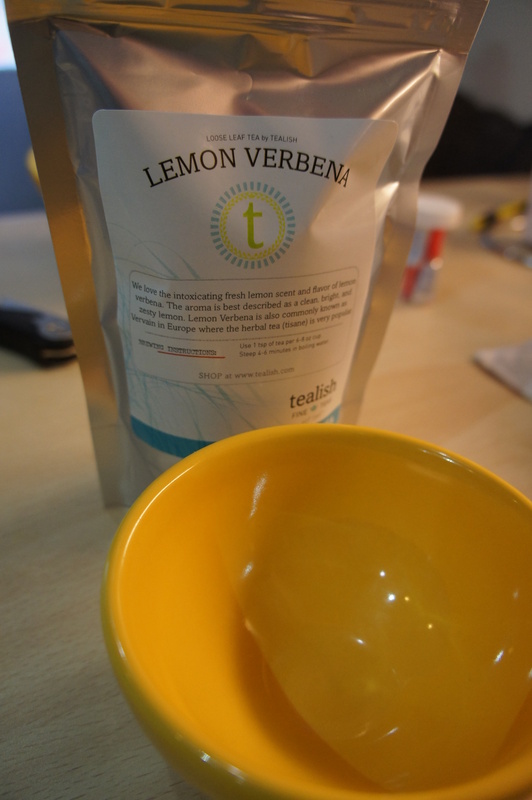 Here in Canada, I didn’t have the opportunity to drink any longer a cup of verbena tea, and I was so pleased when I have had the opportunity to source this delicacy here in Toronto a few years ago. When you live overseas, there are simple pleasures, like finding products that bring you back home and make you feel cheerful: mustard of Dijon and perrier for me, “bonne maman” jam for my friends… and for a lot of us, the petits beurres (French butter cookies) also, French cheeses of course, and verbena. Lemon verbena can be used when cooking, generally in sweet dishes, and this is something I wanted to explore for many years. 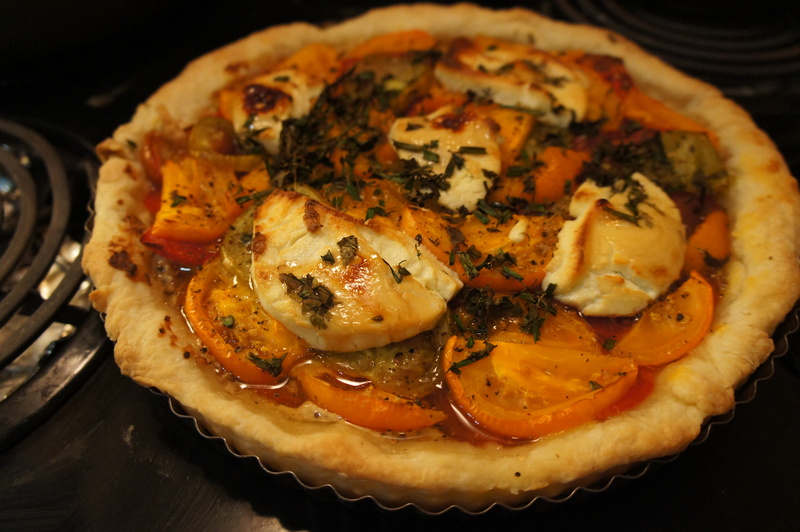 In most of the recipes of peach tatin pies I have reviewed for this blog, people are using fresh verbena. Unfortunately, here in Toronto, it is quite difficult to find a verbena plant. In contrast, verbena as an herbal tea is quite easy to find – ask your favorite gourmet tea boutique, I am pretty sure they have some. 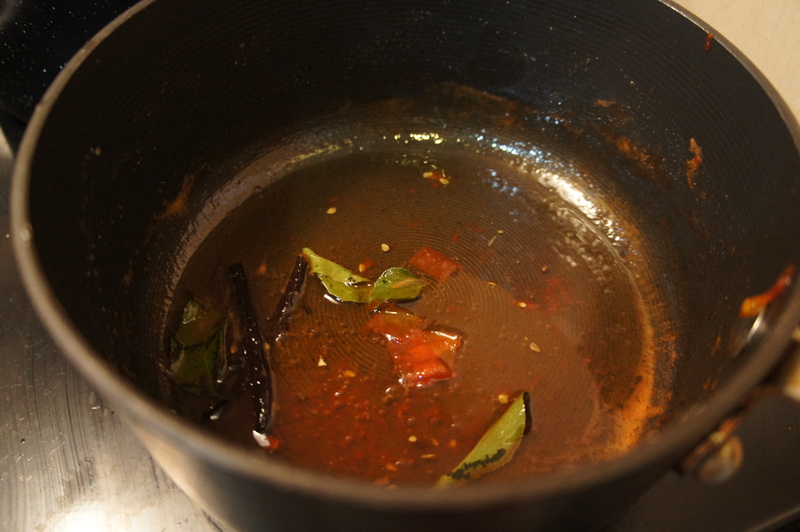 To get all the flavor possible out of the dry leafs, the best solution is to infuse the dry leafs into a liquid. 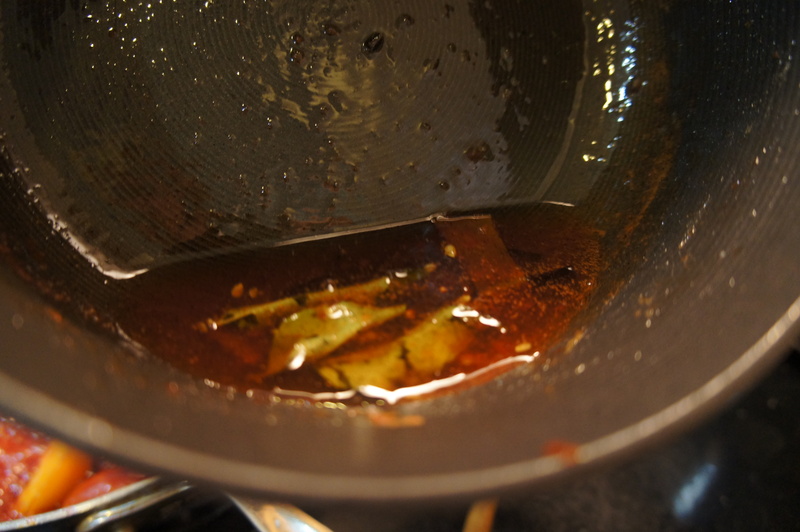 This can be done by steeping the leaves in boiling or near boiling liquid, much the same way as you might make tea, then straining them out before using the liquid in another recipe. And this is exactly the way that I have chosen to follow for the verbena infused cream. Like in Provence, peach and verbena is the perfect combination for a sweet summer treat. 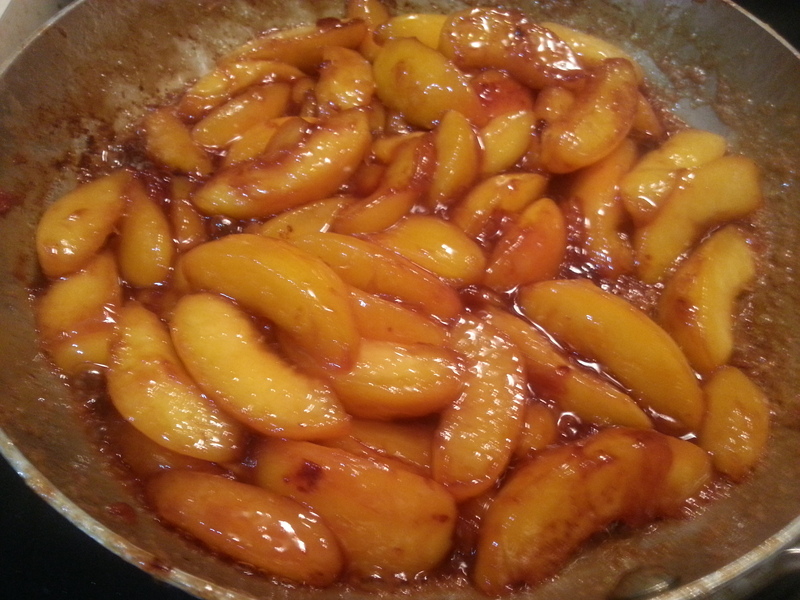 The touch of lemon verbena lends an incredibly bright and fresh streak to the sweet cooked peaches in the tatin pie. Yummy… I was ready to try! I love making pies, any kinds. I do it mostly without looking at a recipe. 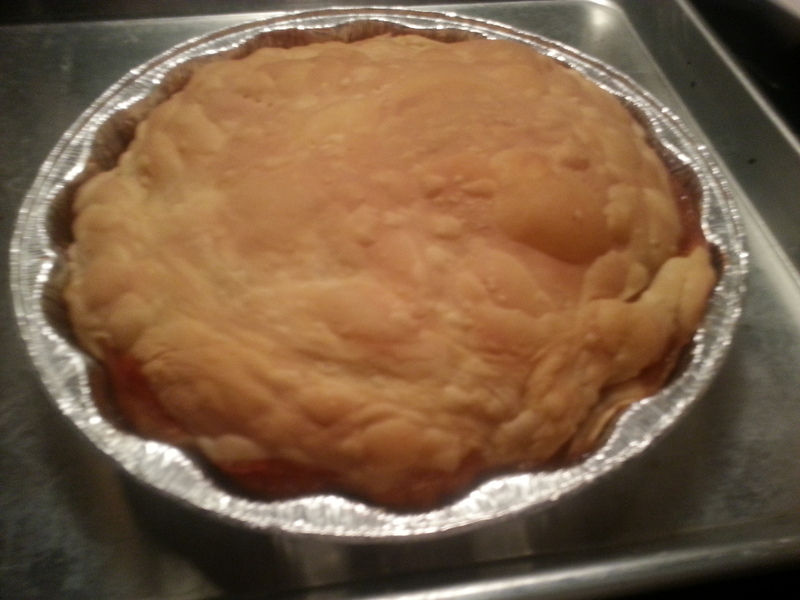 However, for this specific pie, it was quite different and really challenging. 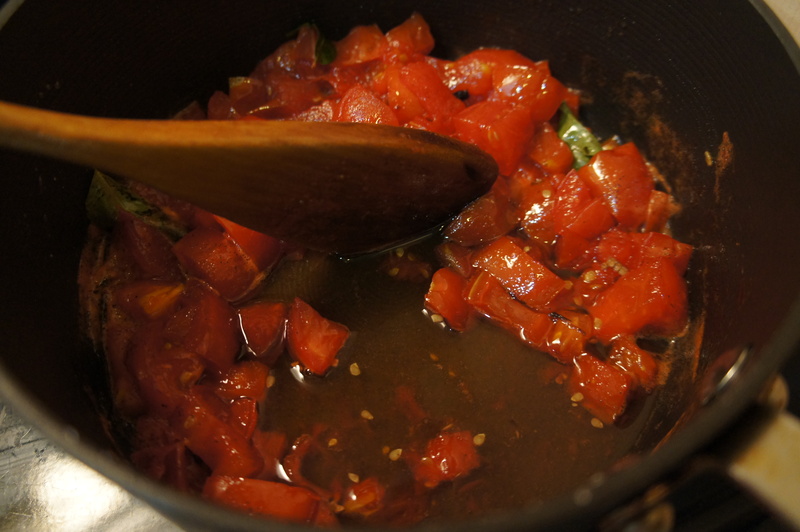 First, it was a new recipe for me. Secondly, I didn’t find any recipe online (except America Test Kitchen) that talks openly about the major issue when baking with peaches: they are really juicy and your pie or cake can be really soggy. 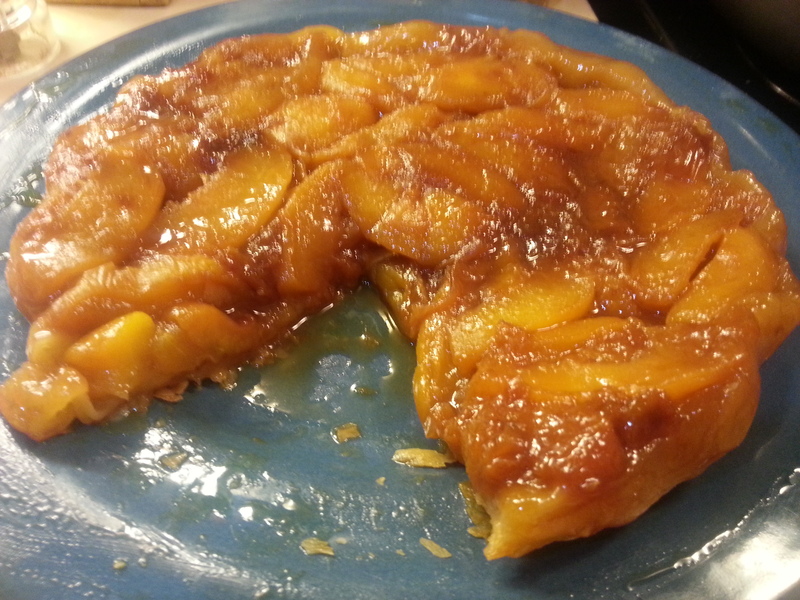 For my first peach tatin pie, I followed the recipe I have found online. No juice before I started to cook the pie in the oven, but after 35 minutes … A flood of juice above the crust, soggy, soggy. 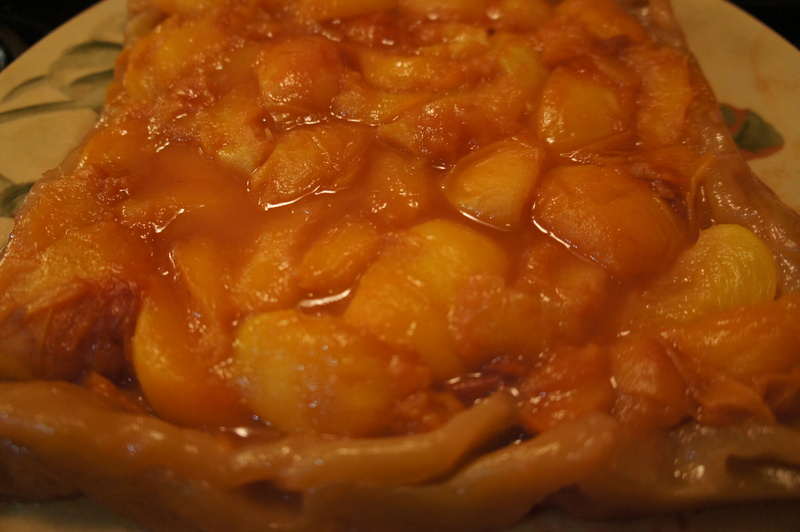 I did it again and again – in total we ate 6 peach tatin pies, improving each time a little bit more to get at the end the perfect peach tatin pie. 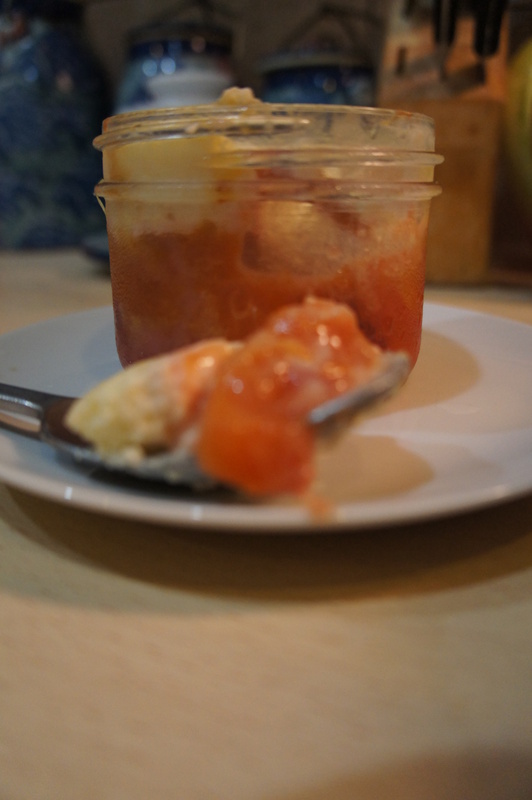 I still love peaches… not a problem! 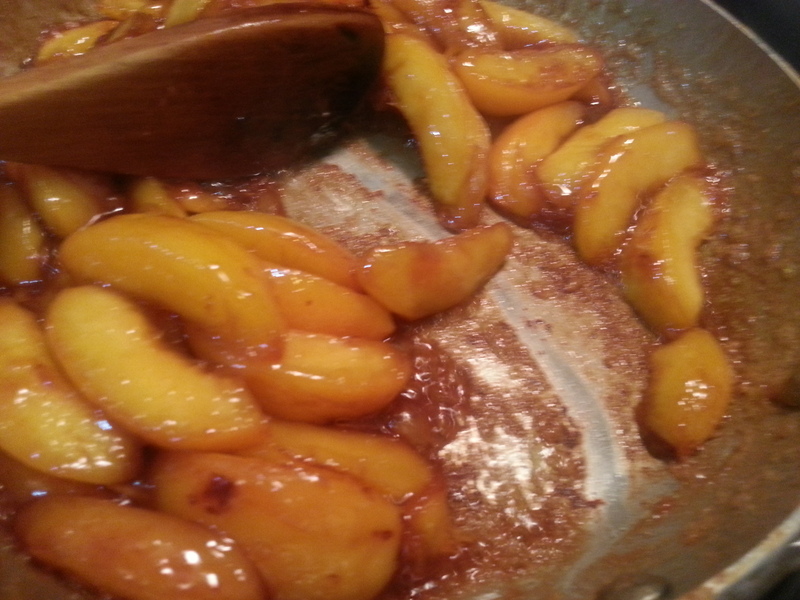 Don’t be afraid to cook your peaches on high heat, to caramelize them perfectly (you can see my pictures soggy vs caramelized). 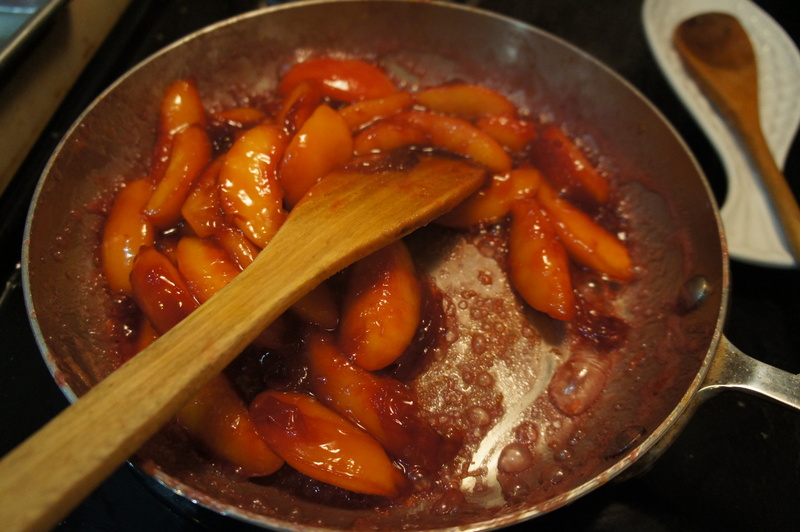 The peach is a delicate fruit and I was afraid to overcook them and obtain some sort of peach marmalade, but it has not been the case. The dry-heat/high-heat method cooks off a lot of water (and you need this) and helps to cook the peaches to just the right texture. If your peaches are not yet at maturity. Place them in a paper bag for 2 to 3 days. 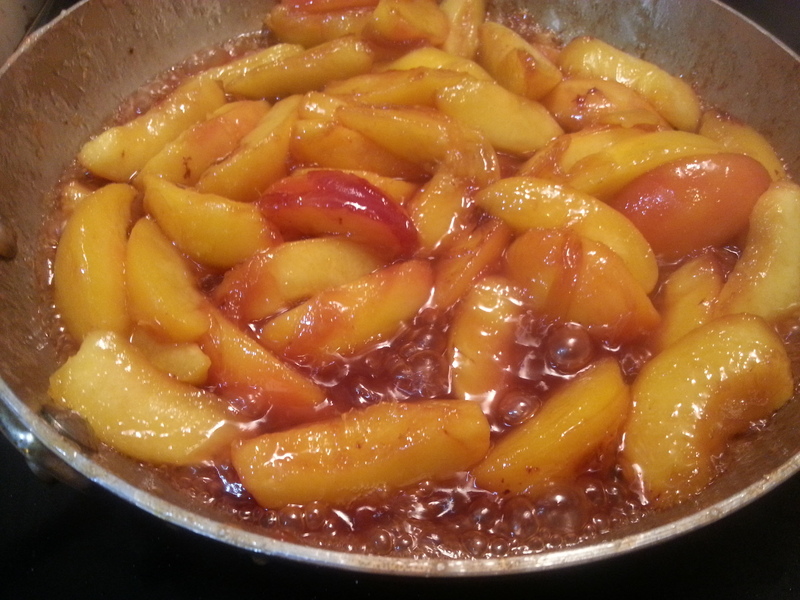 Remove any stems and leaves still present on the peaches. Brush away any visible dirt or residue by hand. Fill a bowl or partially fill your kitchen sink with water, adding a small amount of soap as it fills. 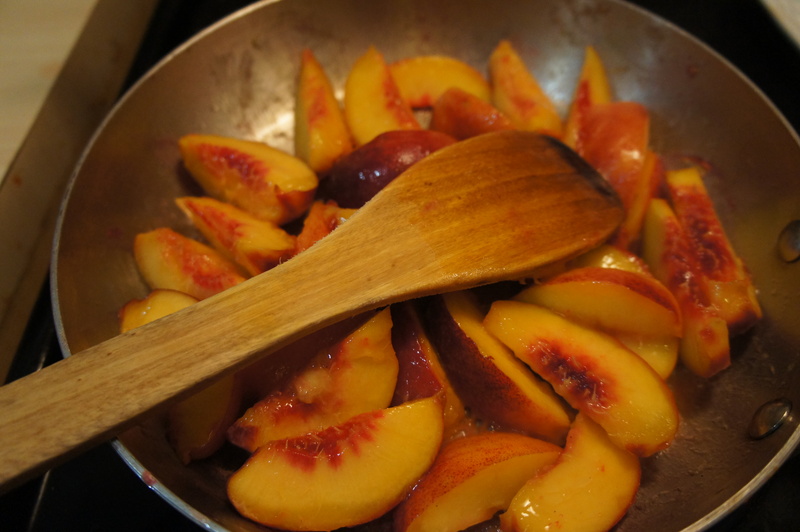 Place the peaches in the bowl or sink, rubbing the surface of the fruit to remove dirt and residue. Rinse the peaches in cool running water. Cut them into quarters. Pan fry them quickly in butter (be sure to use a pan large enough to have one layer of fruits) on high heat for 5 to 7 minutes. It is really important to have at that point no liquid at all because the peaches may release some juice when cooking in the oven, and if this is the case, the peach pie will be soggy. 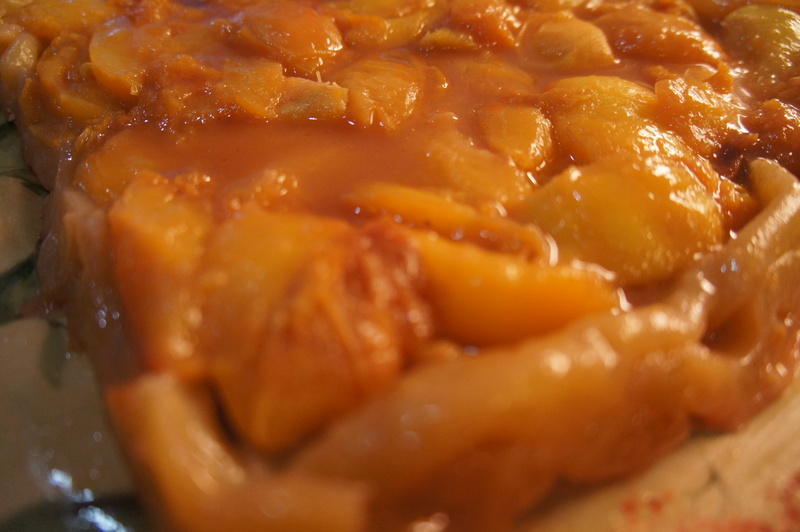 Using a slotted spoon, carefully remove the peaches from the caramel and transfer them to a 9-inch pie dish. 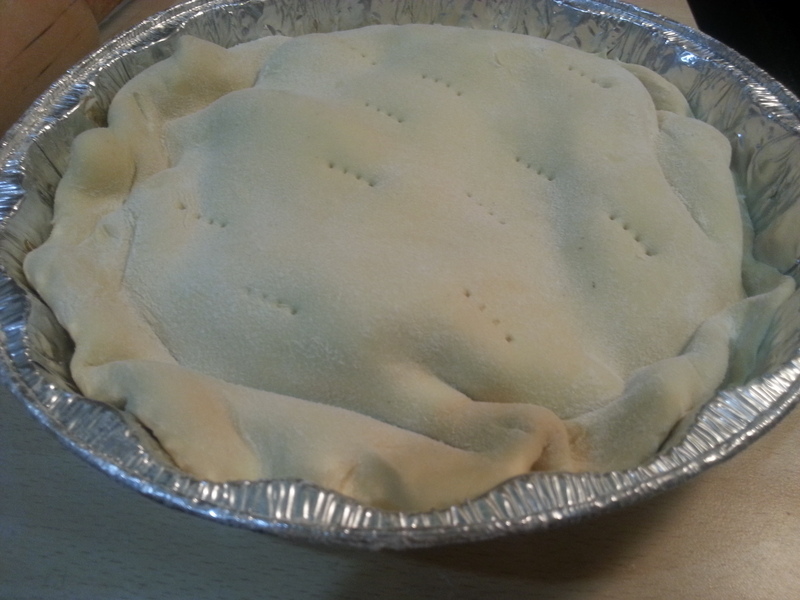 Cut a 10-inch disk out of the puff pastry sheet. 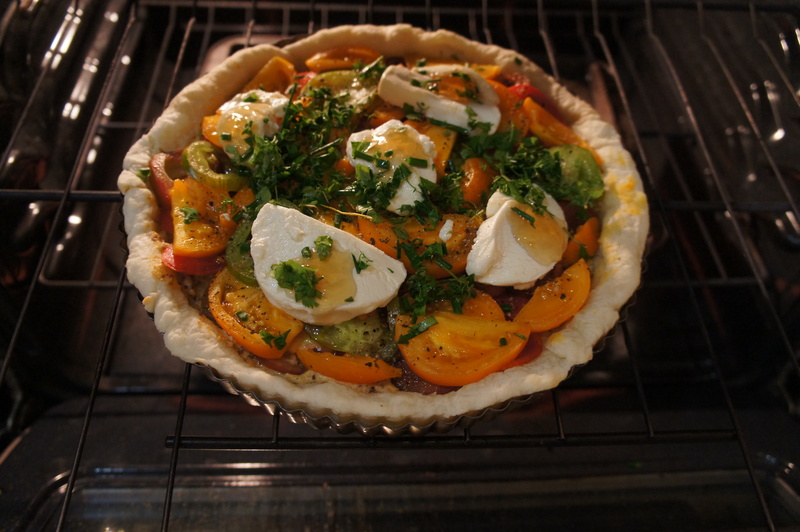 Drape it over the peaches in the pie dish. Bake for 30 to 35 minutes, or until the puff pastry is golden brown. Remove from the oven and let cool for 15 to 25 minutes. Cut around edge of cake pan to loosen pastry. 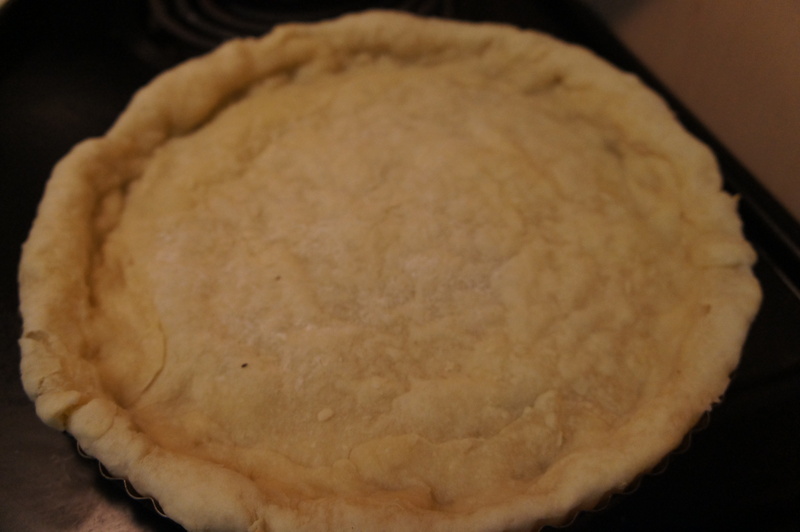 Carefully place a plate on top of the pie, slide your hand under bottom of the pie pan (be sure it’s cool enough to handle, or use a pot holder), and flip over the tart. Carefully lift off cake pan. 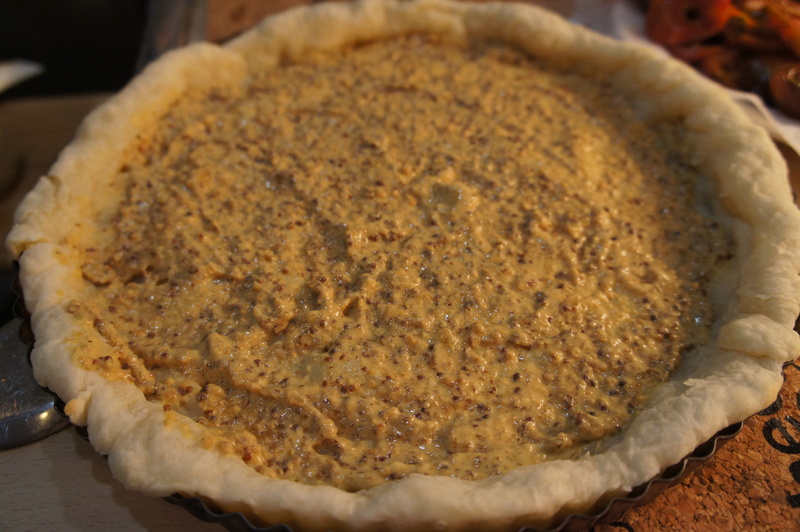 The caramel should ooze out and pool around the tart. 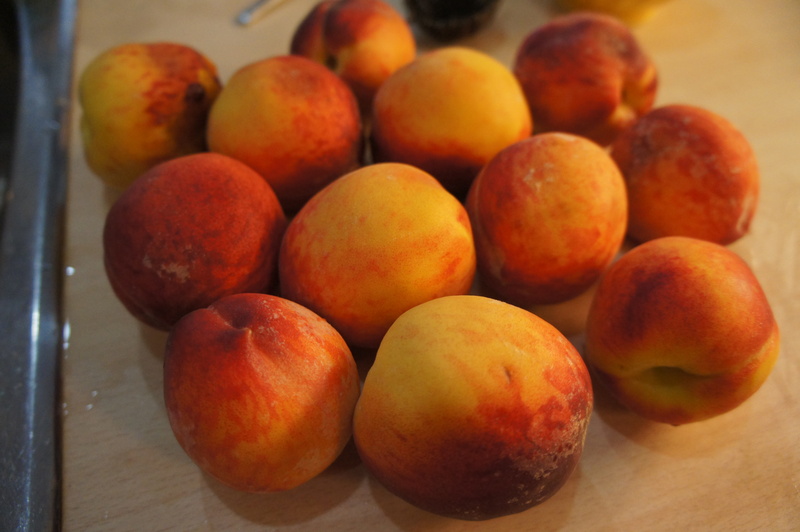 Rearrange any peaches that may have become dislodged. 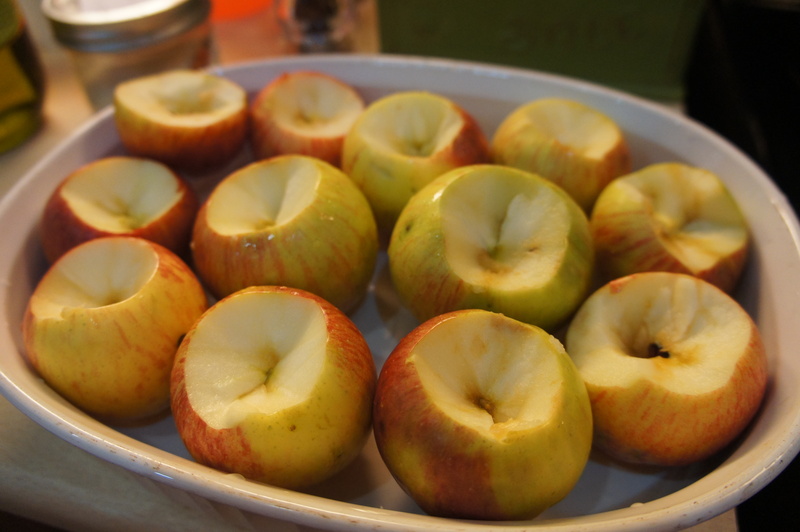 Cut warm tart into wedges; serve with verbena infused whipped cream. 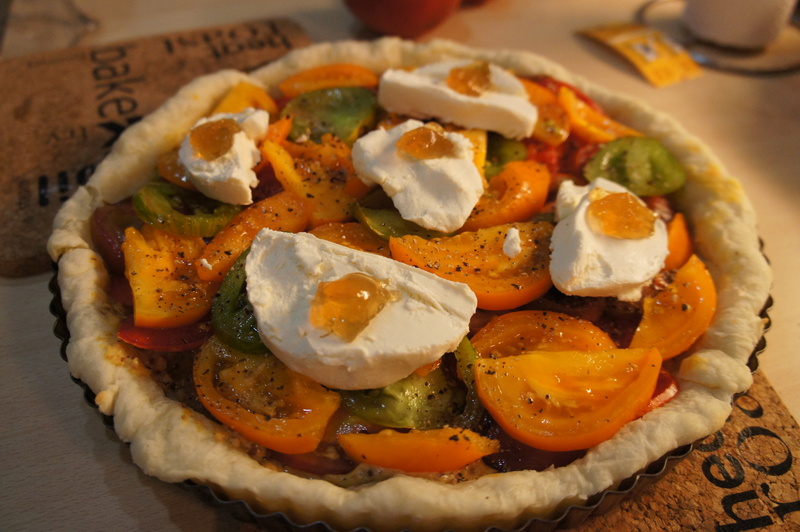 I recommend to cook the pie when eating the first and second courses of your meal, and flip over the tart at the last minutes, just before to serve it. If it is not possible, it can be prepared 6 hours ahead. Let stand in cake pan at room temperature. Rewarm tart in 350°F oven for 10 minutes before continuing. Bring cream to a simmer in a small saucepan. Remove from heat; add lemon verbena. Cover. Let steep 15 minutes. 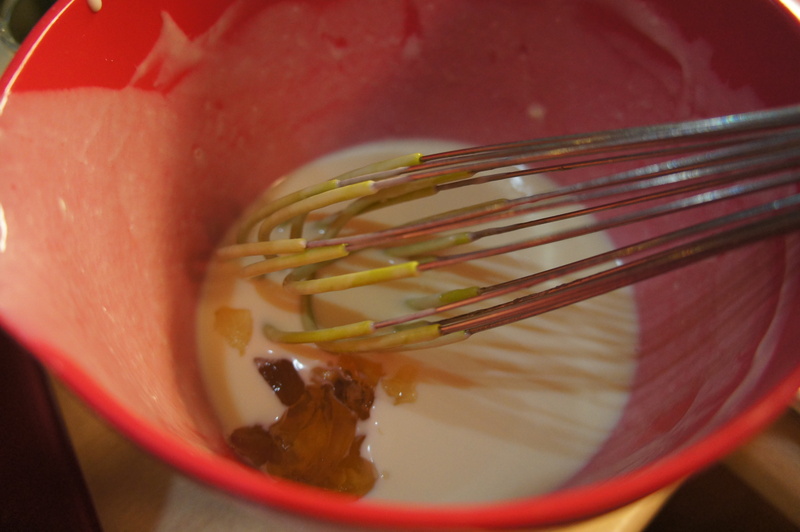 Strain cream into a medium bowl. Cover and chill at least 1 hour. 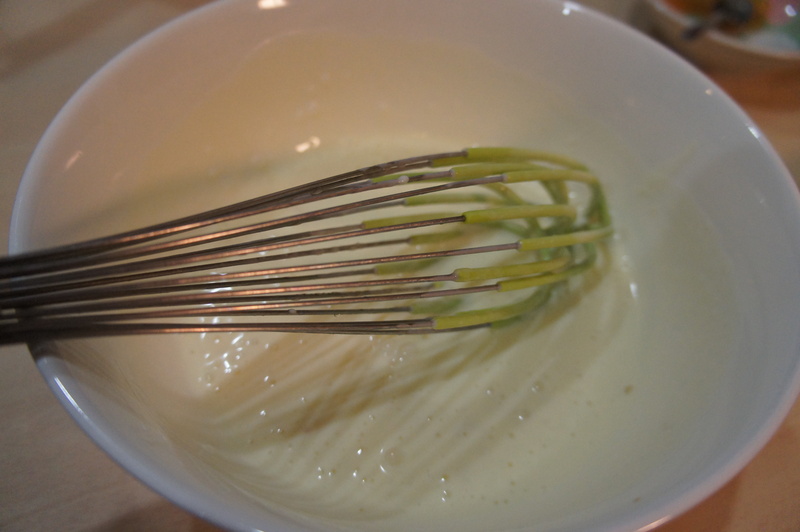 Beat infused cream with 4 tablespoons sugar to soft peaks.